Here is one of the stories life has written, or closer to reality, thanks to Skype on internet three musicians found each other thirty years after they have met and worked together at the Moscow Conservatoire. We all know and love Rauf Kasimov, the pianist, and more lately as the piano tutor to so very talented and budding young pianists in Cyprus. The three musicians have decided to meet in Cyprus, one of them is Pjotr Meshvinski, who will arrive from Hamburg, accompanied by his partner Natalia Alenitsina and their son Emanuel, both exceptional musicians; the other, Leonid Rabinovich, will come from Miami in the United States. What an exciting moment in life to meet each other after such a long time; they will have a lot to tell each other when they meet in March for two weeks and pick up the thread of their lives where they once started off. 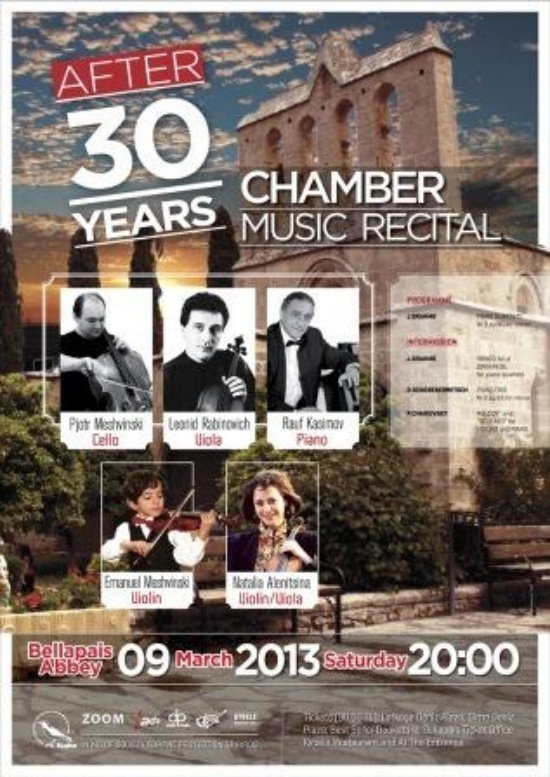 As it is impossible for three musicians – no matter how long they have been apart – not to make music together, because this is their common language - they have set up two special concerts for us here in Cyprus. Pjotr Meshvinski is the director of the famous »St. 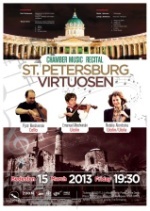 Petersburg Virtuosen« in Hamburg, an ensemble with a wide repertoire of classical music, as soloists or pure chamber music and chamber orchestra. He was born in St. Petersburg in 1966 and started to study cello at the age of six at the Rimsky Korsakov Conservatoire and had his first concert at the age of eleven. In 1984 he continued his studies at the Moscow Tschaikovsky Conservatoire. He had many highly praised performances as soloist with the Soviet American Youth Orchestra and the German Soviet Philharmonic Orchestra. In 1989 he was given an award following the last Soviet competition. In 1991 he went to Hamburg, where he won several prizes from various international Cello and chamber music competitions; he then founded the “St.Petersburg Virtuosen”. He organised many concerts worldwide as soloist and as a group, which is recognized as a high-class ensemble. where she continued her studies at the Hamburg Music Conservatoire. She won very important awards. 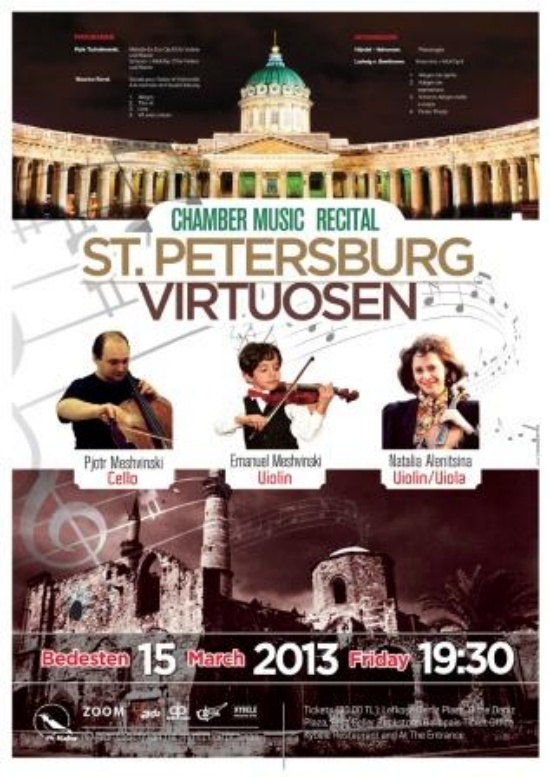 Emanuel Meshvinski is the youngest member of the ‘St.Petersburg Virtuosen’. It does not take wonder that he is also a highly talented kid with parents such as Pjotr and Natalia. He was born in Hamburg in 2002 and the violin became his first toy at the age of two; at the age of 3 he could already play simple melodies and he started to have classes at the age of four, violin and piano. At the age of six he had his first big performance with violin and piano. He is touring with his parents and has thus discovered the wide spectre of classical music. He was born in 1964 in the Ukranian city of Odessa and also began his violin studies at the age of five at the Stoliarskaya School of Music. He was 15 when he gave his first concert, playing such virtuosic works as Paganini’s Capriccio, various works by Sarasate, and the Sibelius Concerto. He continued his music career at Odessa’s Neshdanova Conservatoire of Music, where he received his Master of Fine Arts in Violin. Shortly thereafter he was accepted to the Moscow’s famed Tschaikovsky State Conservatoire to study viola with Prof. Feodor Drushinin. Four years later he graduated with a master’s degree in Viola. During his years at the conservatoire he performed numerous concerts and tours throughout the former Soviet Union, including performances at Rachmaninov Hall and Tschaikovsky Maliy Hall in Moscow. As principal violist of the conservatoire’s soloist ensemble and symphony orchestra, he performed in many European halls, in Spain at the Teatro Real de Madrid and the Teatro de Bilbao, in Germany, in Berlin, Cologne, Stuttgart and Hannover, in Paris, at the Théatre Nouvelle Opéra de la Bastille, and in Brussels at the Queen Elisabeth Concert Hall. 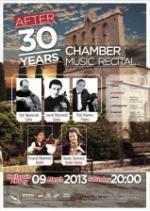 He also performed with the Odessa Philharmonic in 1985-86 and Odessa Opera Orchestra in 1986-87. Mr. Rabinovich arrived in the United States in 1991 to join the Miami based New World Symphony under the artistic direction of conductor Michael Tilson Thomas, where he remained for four seasons. He has given recitals at Miami Dade Community College’s Contemporary Music Festival. At the University of Miami’s Gusman Concert Hall, at the chamber concert series of the Palm Beach International Competition. Mr. Rabinovich’s recent solo appearances include concerts with the Miami Symphony Orchestra both at Miami Beach’s Lincoln theatre and the University of Miami’s Gusman Concert Hall. He performed the Stamnitz Concerto for Viola and Orchestra and the original score of the Sonata per Grande Viola e Orchestra by Paganini which he premiered in the United States. He also performs regularly as principal violist with the Miami Symphony Orchestra. These are two concerts which should not be missed. Tickets will be available at the usual places Deniz Plaza, Bestseller Bookstore, Bellapais ticket office, Kybele Restaurant…and at the entrance.